Emily loves to discover how things work and fix them when they are broken. She loves all things finely crafted by hand. Letterpress brings these two loves together, with lots of hand washing in-between. 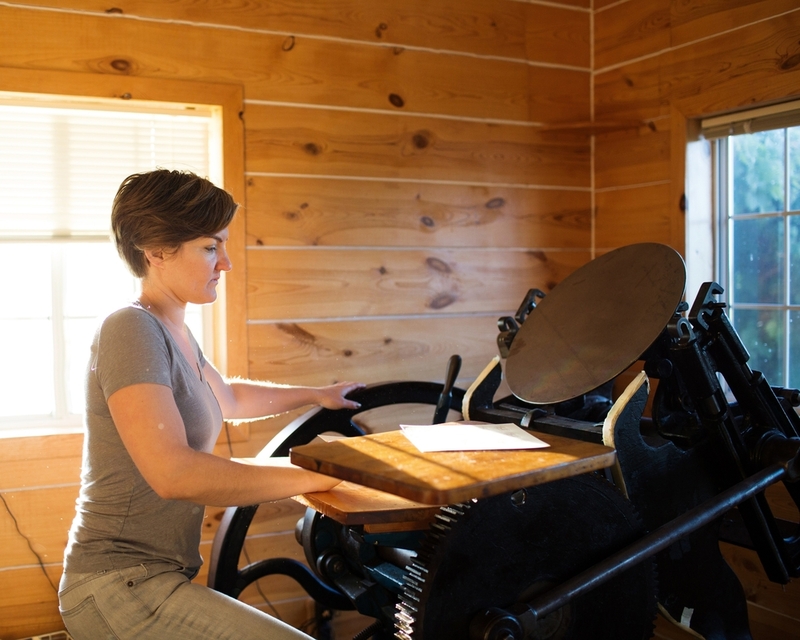 Emily started her letterpress printing business - EMprint Press - in 2004 after earning a degree in physics from Reed College. Perfection is impossible when your tools are 100 years old, but Emily strives for it in every project, nevertheless. Emily's own designs grace her small line of cards and ephemera, as well an extensive portfolio of client projects - both print and web. In 2006 EMprint Press relocated from Berkeley, California to a cattle ranch in South Dakota, which has been in Emily's family for four generations. Then in 2009, new presses were acquired to open a second studio in Portland, Oregon. For a decade, Emily split her time between her beautiful shop in Portland (located in the Yale Union) and her small shop back in Nebraska. In 2018, Emily consolidated her business/life to her hometown of Cody, Nebraska. There she also keeps busy with the family business - George Paul Vinegars - making traditional-style gourmet vinegars. Work still brings Emily back to Portland occasionally to assist with letterpress instruction at Reed College. Emily and her husband Michael welcomed Lula Jean to their family in Oct of 2016. Lula loves her mama's presses and has a precocious affinity for tools, but is nevertheless still not too much help in the printshop. As such, Emily's time at the presses is now quite precious and she is quite selective about the projects she takes on.